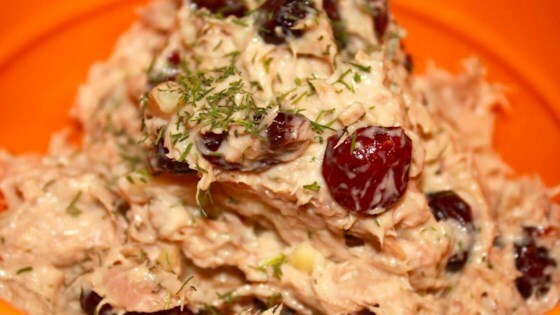 "This simple, unusual recipe will yield the best tuna sandwiches you've ever had! Try on potato bread for a comforting, yummy treat!" Place the tuna in a bowl, and mash with a fork. Mix in mayonnaise to evenly coat tuna. Mix in dill and cranberries, and season with salt. Enjoy on crackers or the bread of your choice! I make a similiar version to this. I use more cranberries and add slivered almonds and chopped onion. I don't use any dill at all. Makes a tuna sandwich a more interesting. Really good! A nice change from regular tuna sandwiches. I don't care for dill weed, so I just left it out. I made this for lunch today and while it was very tasty, I think that I'll make it differently next time by adding more cranberries and perhaps something crunchy like almonds, pecans, or walnuts. Very tastey, but for more of a kick I added some dijon mustard. Very yummy and a nice change from the regular tuna sandwhich.